Everyone shall have the right to have property in his or her ownership, to possess, use and manage it either individually or jointly with other persons. No one may be arbitrarily deprived of his or her property unless on the basis of decision by a court of law. Property can be forcibly alienated for state needs only on condition of a preliminary and equal compensation. Therefore, under what legal pretense can the Moscow Patriarchate attempt to seize things it had no possession of, and indeed, had rescinded any possession of? Bp. Andrew in response to the statements of MP hierarchs that they can ‘take’ whatever they want from True Orthodox in Russia should give shudder to everyone; even if you aren’t in theological sympathy with them, you should at least realize the slippery slope that follows. We know see the real purveyors of discord, malice, and ill will. True Orthodox should never have to justify their existence from accusations of ‘lack of love’; in the reverse, it has been the World ‘Orthodox’ more than any other who have truly demonstrated even the most basic lack of love for neighbor. Legally, the Russian constitution gives no preference to one group or the other by means of allowing one group to seize the property of another. If the MP wishes to change the Russian Federation constitution by giving itself the power to seize anything, they should do so openly; rather than acting under colour of law. In similar manner to that above, Bp. Andrew of ROAC, answer other erroneous accusations and suggestions, in a response here (most noticeably, to the suggestion that Met. Valentine somehow took money from the US government). His statement is below, and can be found separately here. Metropolitan Sergey said in his television interviews that it is right that the relics of Sts. Euphrosynia and Euphemios should be given to the grace-filled church, and that it is about time that they be taken away from the schismatics of the ROAC. He doesn’t see why this can’t be done without reproaching each other. Why it can’t be done in love. Was it with love that the local authorities, at the behest of the MP, took away every last church from the ROAC in the Vladimir oblast, after our people poured in hundreds of thousands of dollars over the last 20 years, leaving our priests with no place to perform services, and our people with no place to attend services? 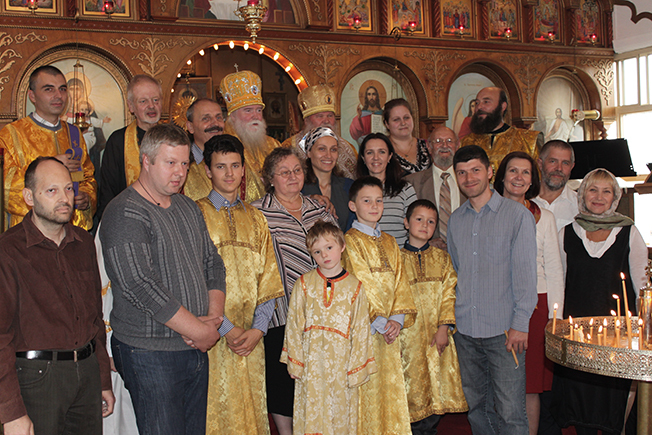 Our parishioners and clergy are also citizens of Suzdal, the Vladimir region, and of Russia. Why do their God-given rights not matter to the government officials who are supposed to uphold the rule of law for all its citizens with neutrality and impartiality? Is it really necessary for the MP to have possession of ALL churches in Suzdal; every last one of them? Is it really not possible for the ROAC to have ONE of the churches that we spent so much time and effort on? Is Met. Sergey so sure that the ROAC is without grace? How would he know? Does he not belong to the MP, which 5 years ago joined the ROCOR, which anathematized ecumenism in 1983? Does not his church recognize the presence of grace in the Roman Catholic Church, the Anglican Church, the Lutheran Church, and others that also belong to the World Council of Churches, with all of their blasphemous heresies and sacrilegious services? How is it that he sees grace in these faiths, but not in the faith of his fellow citizens, who profess nothing other that what the Orthodox Church has historically professed over the past 2,000 years? Could it be that he does not really recognize where grace is present, and where it is not? And why would that be? Maybe because he is foreign to the action of grace altogether in his church, which from its inception 1943, when Stalin founded it, is based on lies, heresies, and apostasy, and from which grace has long ago been withdrawn? St. Euphrosynia and St. Euphemios are exactly where they were for many centuries before the revolution–with the ORTHODOX believers of their city, who love them for who they are, and not because of some practical consideration that they might derive from having possession their relics, like the members of the MP, who want them so that they can derive financial benefit from the relics, selling tickets to tourists who come to gawk at them out of curiosity. So, all of the amateur theologians whose opinion was asked of them as they walked on the streets of Suzdal can rest assured that, just as they expressed, the relics of these Saints are back where they belong. Now, it’s time for them to join their beloved Saints in the TRUE Church, and leave behind the godless hierarchs of the false church that they belong to. Then they will be together with their Saints not only for the duration of their lives on the earth, but all for eternity.